Haha! You are enjoying this too much!!! So what about parasites in these wild caught locusts? I've read some horror stories with wild caught bugs. Let's say I do manage to successfully breed these locust, are the parasites passed along or can I consider the new generation parasite free? The odds of parasites is actually quite low. Also, most of the parasites the bugs carry actualy affect the bug and does not infest the chameleon! Furthermore, the nutritional content of wild caught bugs is much superior to that of bugs bred in captivity! Parasites does not get passed on in eggs laid on branches or leaves. Parasites do not pass to the next generation of insects as long as you house them in seperate containers before they hatch. Which you have to for locusts etc. So what your saying is there is a demand for these that isn't being met? 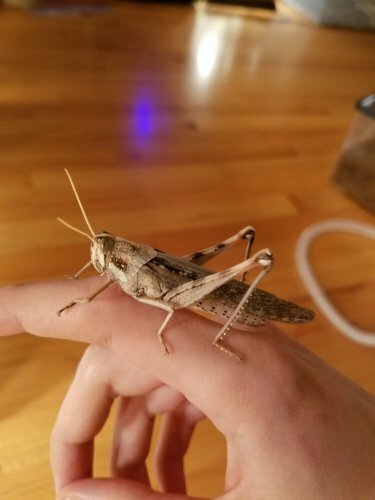 What kind of grasshopper or locust is this? A "Carolina" locust? There are a billion of them in my yard right now, I live in southeast Louisiana. Disabled War Vet, Retired U.S. Marine in search of Locusts/grasshoppers. I reside in Los Angeles, Ca. and have no source locally. 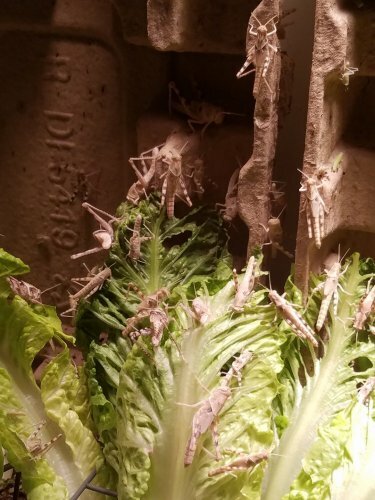 Anybody out there that can help, my Mantids are having a craving. Thank you!! When I kept mantis they would eat nearly any bug. Yes, I am very well aware of that, however your response does me NO good. I know what I want, and so do my Mantids!! Thank you for your service! So I’m assuming your not physically able to catch and breed your own, true? I can’t help you with getting some today but I might be able to make it easier for you in the future. Have you ever considered a light trap? Good Day!! Not a problem, That is what U.S. Marines do best!! You are correct; Physically, I am unable to catch them. Breeding is not a problem. That is what I hope to be able to do. The other problem is geographical location. Here in the city of Los Angeles Locusts/Grasshoppers are not common at all. About the time frame; I was hoping that with early spring coming on they would be making their annual appearance. I would appreciate any help that you would have to offer. Thank you for your response. Honestly, I was hoping to hear from you, and I am glad that I did. Take care and GOD Bless!! Well I don’t know if you can do any of this but I’ll put it out there, you can decide if you want to try it. I live in southeast Louisiana. So we’re pretty much the bug capital of the USA. There are two different ways I catch all my locusts one is a light trap and the other is just a bulleye. I’ll start with the bulleye since it’s simpler. I know you’re in Los Angeles but you’re gonna have to find a place with a decent amount of wild locus. Every night right after the sun goes down I walk into a field with shoulder high grass with my light and just scan the top half of the grass. Locust tend to sit out In the open at night and they freeze when you shine the light on them just like a deer does. You can then just walk up to them and pick them up, they don’t even try to run. It’s almost too easy. It’s nothing to catch a couple hundred in a few hours . The other way to do it is to build a light trap. Everyone has seen how stupid bugs get around bright lights for whatever reason they fly right to them, a light trap uses that fact against them. There are two different ways to build a light trip one way is to get a rechargeable black light and a bright white sheet and go hang it up in an area with lots of wild bugs the black light will bounce off of the white sheet and draw all the bugs to it. 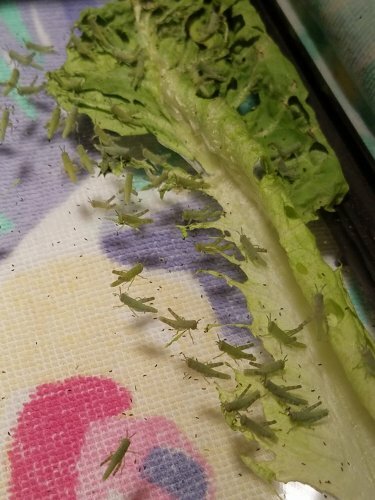 When they land on the sheet just scoop them up , This way it works really well for big moths and some smaller locusts. Now if you want a high-performance light trap it will require a generator and a high-pressure sodium bulb, it’s used in the same way the black light version is. You find a field with lots of bugs and you put that bulb on top of good six or 7 foot pole and crank up the generator it will take about 30 minutes but every locus that can see that bulb will be driven to fly to it. At the top of the pole And behind the bulb is a backboard the crickets fly to the light and run into the backboard and fall to the ground stunned. It doesn’t kill them just stands of them long enough for you to pick them up. I appreciate all your advice, however It would be impossible for me to accomplish either or any of these. Remember, I am disabled. Secondly, as I stated, I live in Los Angeles, The Big City, concrete and steel. We have no access to any kind of feeder insects, especially Locust/Grasshoppers. I guess what I would be asking is; If you could do it, and then ship them to me. Once I get them, then I could just raise them. Raising them is not a problem, as I raise my mantids. It is all up to you. PLEASE, DO NOT feel obligated to do this because I am a Disabled Vet. I do thank you for all your time, and your help. I understand your disabled but that’s the best I can do to help you since shipping them is illegal. Good luck! Hey, just wanted to let you know that you're actually living in the area with the greatest population of gray bird grasshoppers. They are common in Los Angeles. If you can get a pair or two, it is easy to start a colony of them. Nice there are a couple of chameleon keepers in southern California that have or used to have captive colonies of Schistocerca going. My Schistocerca nitens I bred to F3 generation. I would have bred them longer except I spoiled my adult chameleons that Spring. I should also add that I have an excess of them, so I'm willing to ship them within California as long as its legal. I understand that shipping across state lines is illegal, but does anyone know if its fine to ship within state?